Spark ignition in concept is simple. Induce a high-tension current at exactly the precise moment, and you can make a spark jump a small gap inside an engine’s combustion chamber. Spark gaps from early on were about 0.8mm, or 0.031 of an inch. With such a gap, 15,000 volts or more is required to overcome the inherent resistance of the air and mixture in the gap and start a current flowing, but when it jumps across, lightning strikes. Initial temperatures in the plasma formed by the spark can be more than 100,000 degrees, as all molecules where the current begins are disassociated into their highly reactive individual atoms. As the current flow continues, the average temperature in the sustained arc drops to just over 10,000 degrees. This is more than sufficient to begin to burn the oxygen and components of fuel mixture in the gap, forming an initial flame kernel that will spread out to burn essentially all the mixture in the combustion chamber. The spark plug provides the gap at a precise location and in replaceable form; as you might suspect, the high current and hostile environment inside an engine eventually leads to a nonserviceable spark gap. The plug itself consists of three main parts: an outer steel shell that screws into a hole tapped into the cylinder head and acts as the ground for the current, a center conducting rod (the central electrode) to transmit the current (and heat as well), and a resistant electrical insulator between them. In the early days, the insulator was porcelain (fragile) or stacked mica (difficult to seal), and the central electrode might be highly conductive copper. Later, the insulator would be sintered alumina, a strong, electrically nonconductive ceramic that has the added benefit of conducting heat relatively well—more on that later. Because pressure inside a combustion chamber can be well over 1,000 psi at its peak, sealing on a spark plug is critical. Typically, the joint between the outer shell and cylinder head is sealed with a crush washer, but it’s also necessary to seal between shell and insulator, as well as the insulator and central electrode. This is done with compressed glass/powdered metal joints during manufacture on current plugs, but was handled by brazing these joints on early plugs. During operation, the tip of the electrode and surrounding insulator inside the engine is exposed to raw fuel, combustion byproducts, and even engine oil that slips past piston rings. It is heated by combustion itself. If the electrode tip gets too hot, it can serve as a hot spot causing preignition and detonation, or even melt. 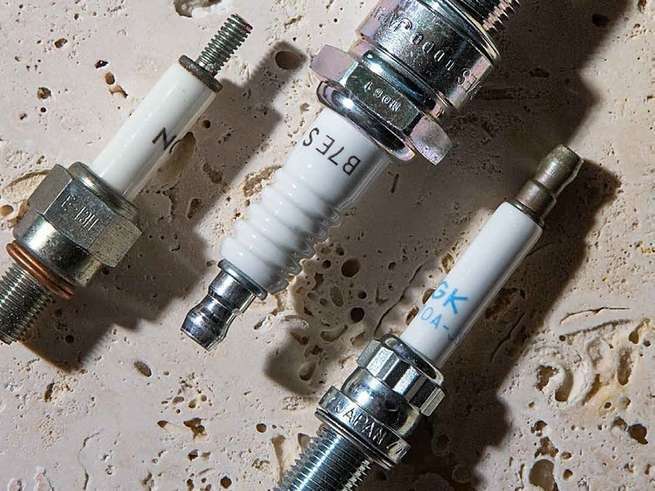 Not surprisingly, temperature control in a spark plug is a major design issue, and spark plugs are designed in various heat ranges, the choice of which depends on the characteristics of a particular engine or even duty cycle. You can recognize these design choices by looking at how the insulator at the &shy;electrode end is tapered; a long tapered electrode that reaches far down into the shell before making contact is a “hot” plug because the heat path from tip through insulator to shell to cylinder head is longer. A “cold” plug might have the ceramic come almost to the end of the outer shell. The idea is to have the insulator run at a high enough temperature that it is self-cleaning for carbon and other deposits, and still have enough heat flow away from the electrode tip that it doesn’t overheat. This balancing act has been &shy;predetermined by factory engineers, so generally the recommended plug is best unless you dramatically change engine tune or run someplace with an unusual duty cycle, like Daytona International Speedway with its 50-percent-wide-open-throttle laps. Additionally, the electrode material on more-expensive plugs may be made of a high-temperature, “noble” corrosion-resistant metal such as platinum or iridium. With their tolerance of higher temperature, these can be reduced to fine wires, which both makes forming the initial spark easier electrically and reduces the heat flow back into the plug. Note: The article was reproduced in MotorcycleUSA.